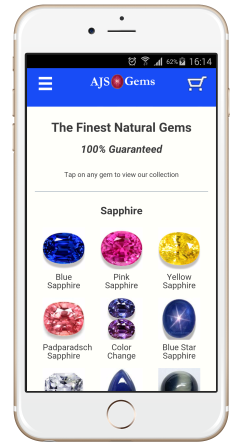 Now you can browse fine gemstones wherever you are, on the mobile version of AJSgem.com. Whether you're using an iPhone, Android or Windows phone, you can now access all the great features of our desktop website on your mobile. Our mobile web pages are specially designed for smaller screens, with simplified navigation and high resolution gem photos and videos. Like our desktop site, our mobile home page is a visual directory of all the gem varieties in our collection. You'll also find a wealth of useful information, including all our original articles, and handy reference charts on gemstone hardness, refractive index and density. And of course you can read our monthly newsletter on your mobile and see our latest notable gems. If you access www.ajsgem.com from your phone's browser, you'll automatically get the mobile version of our website. If you're using a tablet such as the iPad, you'll get the desktop version of our website, which scales nicely to the tablet screen size. This month we feature some fine new acquisitions to our collection in the blue and green color range. A fine cabochon tsavorite in a medium chrome green. This is highly translucent material in a large size at a very attractive price. This lovely pear shape will set up beautifully in your jewelry design. Guaranteed natural and untreated. A dazzling large zircon in a vivd blue! This is beautiful material, very clean, with superb brilliance and sparkle. Well cut with excellent luster, this large zircon will make an impressive ring or pendant. A splendid large gem silica specimen from the famous Ray Mine in Arizona. This large crystal is a vivid greenish blue and the gemmy material displays considerable translucency. This 169 carat specimen stands over 50 mm tall and the sculptural shape is a product of nature. A treasure for the gem silica collector .. guaranteed natural and untreated. A lovely example of transparent oligoclase from East Africa. The color is an attractive pastel green with blue and gold flashes. This 5 carat cushion is nice and bright and is perfectly sized for a unique ring. Guaranteed natural and untreated. An unusual and unique matched pair of very fine beryls -- an aquamarine and a morganite. These large pears are beautifully matched and completely clean, and will make a gorgeous set of drop earrings. Truly a one-of-a-kind set for the colored gemstone collector ... guaranteed natural and untreated. Sotheby's set a new record for colored gemstones with the sale of a 25.59 ct pigeon blood Burma Ruby for $30.3 million ($1.1 million per carat) at their Geneva sale. Part of a collection of Cartier jewels, the "Sunrise Ruby" sold for twice its pre-sale estimated price. Christie's set a new record for sapphire with the sale of a 35.09 ct Kashmir cushion for $7.3 million. They also sold a 5.18 ct fancy vivid pink diamond for $10.7 million. Blue topaz is a very common material because it is produced by treating cheap colorless topaz with radiation. Indeed, the cost of the material is mainly in the cost of the irradiation process. The color of aquamarine is usually completely natural, and aquamarine with a fine blue color is quite rare. Hence the difference in price. Opal has a hardness of 5.5 to 6.5, so it is somewhat soft. It can acquire scratches, but cut as a cabochon it is fairly durable. Opal is not a good choice for an everyday ring, but opal rings have been popular for centuries, so if you are careful with your opal ring and wear it on an occasional basis, it should last for a long time. A protective setting can be helpful as well.